The World Cup Round of 16 continued with some exciting action in today’s fixtures. Brazil took on Mexico and Belgium faced off against Japan. Both games were exciting and had their fair share of narratives to pull out. World Cup betting odds now favor Brazil, as they are the only tournament favorites remaining, at least out of the top favorites. Germany, Argentina, Spain, and Portugal have all been knocked out. Mexico, on the other hand, was a surprise of the tournament after defeating Germany in their first match. Brazil was favorited to win this game, but their 2-0 victory did not come easy. Mexico was pressing from the beginning. 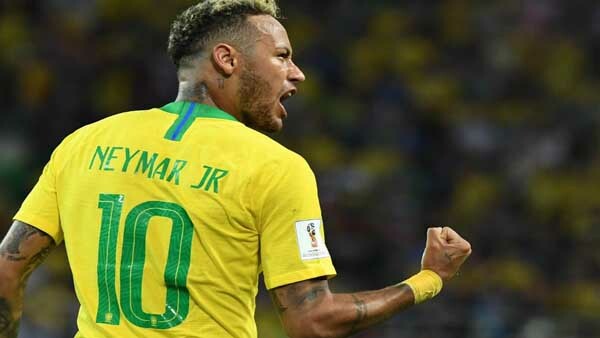 They were aggressive on the ball and Neymar, who was targeted by the media and Mexican players for overdramatizing fouls against him in the days leading up to the match. Neymar was quick to respond to his critics by having an early chance against Mexico, but he was denied by their goalkeeper. Brazil had several more chances in the first half through Gabriel Jesus and Coutinho, but nothing went through. Mexico had more possession, but Brazil made the most of their chances. After the break, Brazil came out the aggressors and Willian sent a low cross across the face of goal for Neymar to easily tap in. Mexico tried to answer back through Vela, but the ball was tipped over by the Brazilian keeper. Neymar found some controversy again after falling to the ground after he was touched on the ankle, eating up valuable time in the process. Shortly after his injury, Neymar provided Roberto Firmino with a nice tap-in goal to seal Brazil’s place in the quarterfinals. The Belgium-Japan game was arguably the most exciting so far. Belgium were the clear favorites, but Japan was setting an aggressive press that kept Belgium from making any plays. The action began in the second half when Japan’s Genki Haraguchi scored in the 48th minute. Japan continued their pressing and scored another goal minutes later through Takashi Inui. Down 0-2, the Belgians looked set to be another upset in this wild World Cup. Belgium finally made some much-needed substitutes and the tide began to switch in their favor. Jan Vertonghen scored a long-range header to bring his side back into contention and substitute Marouane Fellaini cemented the comeback with a header of his own 5 minutes later. The game looked to be headed towards the extra time when Japan attempted one last shot on goal. Keeper Thibaut Courtois collected the ball and quickly rolled it out to begin a swift counterattack. The Belgians were able to connect some nice passes to set up a low cross from the right flank. Romelu Lukaku pulled off an incredible dummy to let the ball roll to a wide open Nacer Chadli who passed the ball into the back of the net with seconds remaining in the game. It was a hard-fought game that deserved to go into extra time, but Belgium capitalized to guarantee their spot in the next round. These games set up a Brazil-Belgium quarterfinal matchup on Friday. Brazil will enter the favorite, but this Belgium team has yet to lose a game in this tournament. It will be the toughest match for both teams so far, but will likely be an exciting fixture.